For some homeowners, the thought of relaxing in hot churning water to soak away the tensions and stress of everyday life is more appealing than taking a plunge in a cool swimming pool. A portable spa is versatile, practical and would make a great addition to any poolscape. 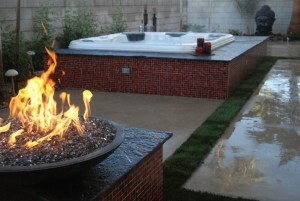 Attractive as a stand alone element, the spa is ideal when incorporated into the overall design of any Las Vegas backyard landscaping. 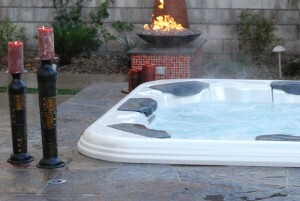 Laguna can help you to experience the therapeutic benefits of soaking in hot bubbling water by making a spa an integral part of your outdoor living space to be enjoyed throughout the seasons. Often called portable spas, these self-contained units are available in a wide variety of shapes and sizes to compliment any new swimming pool design or as an added feature to a remodeling project. For backyards that are too small to accommodate a pool, the portable spa is ideal as an attractive and practical stand-alone amenity. Many homeowners prefer the comfort and convenience of a portable spa but found the drawback was a lack of a one of a kind design that could seamlessly integrate into the existing backyard landscape. Constructing a spascape around a pre-fabricated unit eliminates those concerns. 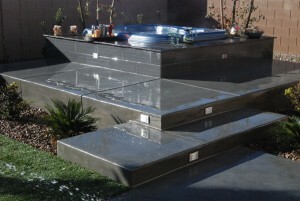 The spa rests on a level pad that provides the support necessary for the maximum weight when filled, but can be installed either in-ground or above ground. By fully or partially recessing the spa into the deck surface, a more open area is created. The surrounding ledge in a recessed spa is a great place to sit and dangle your feet and legs into the warm water and makes getting in and out of the spa much easier. The same can be said by building a patio or deck around an above ground installation. Portable spas can be completely customized with features such as rock waterfalls and gazebos which will increase the aesthetics and enjoyment throughout the year.